A new set of global guidelines on managing diabetes (that plan to replace those followed nearly for thirty years) has been released by American College of Physicians, organization comprising internal medicine physicians. The same has been published in medical journal Annals of Internal Medicine. It says clinicians should aim to achieve an HbA1c level between 7% and 8% in most patients with type 2 diabetes (against the current 6.5 to 7%). This new figure has caused disagreement within the medical community. Medical practitioners in India opine that this may lead to serious complications in diabetics; so it should be ignored for Indians. There were around 72 million diabetics in India in 2017 (as per International Diabetes Federation). HbA1c is long-term blood sugar target, hemoglobin A1C (HbA1c) and it is an estimation of a person’s average blood sugar level over the past few months1. Important point here is that how long common or standard diagnostic range for terming a person patient, will be taken into consideration? These diagnostic ranges may/should be different for varied race, geographical regions based on various socio-economical habits, conditions and practices. 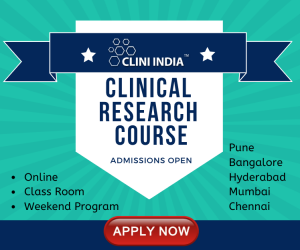 Looking at the vast expertise, infrastructure, expenses in defining these ranges based on clinical trial and other specific tests (associated with drug discovery or epidemiological survey, pharmacovigilance etc); it seems difficult to have set up/provisions for different geographical locations for a common diagnostic tests. Who will play crucial role in collecting, churning, filtering and analyzing huge data garnered from these operations? Definitely humans can’t. Then who will do? Machines learning which is controlled by artificial intelligence which in turn designed by human intelligence. Recent technological advancement in healthcare from view point of artificial intelligence (AI) & machine learning (MI) besides big data analytics will witness drastic changes the way we diagnose/treat diseases. Before I go ahead let me write here about these three. This is time for industry 4.0. In this era of fourth industrial revolution using artificial intelligence, humans would be able to create the most sophisticated and intelligent machines that would not only understand human needs (and do things on their own without attending them), but also teach/update/assist their creators (humans) about more fruitful outcome based on one time/initial inputs fed by humans by a process called machine learning (ML). Machine learning is the capability of a machine to improve/advance its performance/output based on previous results and inputs. Machine learning methods enable computers to learn (on their own) without being explicitly programmed and have multiple applications, for example, in the improvement of data mining algorithms. In coming years non-humans (inanimate object at our home) will be communicating with each other on behalf of humans (owners). This will be like, fridge may communicate with kitchen ingredients, cooking platform, juicer and likes of based on preferences and past data of humans dwelling in that home. This is called internet of things (IoT). Big data analytics and block chain are integral parts of all these algorithm based technology. Importance of artificial intelligence as per the information shared on one of top IT giants in the world, Infosys: “Artificial intelligence is becoming a core aspect of business strategy. Moreover, broader adoption of AI is fundamentally changing every aspect of the way leaders lead—from the way they recruit and train, to the way they inspire teams, to the way they apply AI and human power together to achieve their vision for the company, to the way they drive innovation and compete. 45% of IT decision makers report improved process performance from AI and 40% report productivity gains due to IT time spent on higher-value innovative work. A primary factor driving ROI from AI, according to the research, was a clearly defined strategy. 80% of respondents who said they've seen at least some measurable benefits from AI agreed or strongly agreed that their organization had a defined strategy for deploying AI. Business leaders not only have to evolve quickly in this new and dynamic environment, but they also need to champion change throughout the organization to bridge the gap between old and new business and work realities. A full 76% of all respondents were either confident or extremely confident that the senior leaders of their organization understand and promote the positive aspects of AI”. 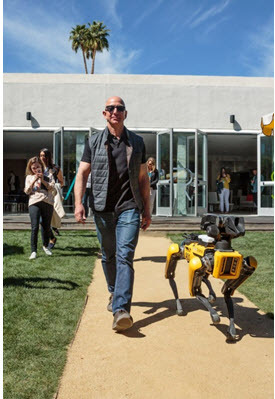 This picture of robotic dog with his boss, who is also the richest human on Planet Earth, Jeff Bezos has many hidden messages. Not only potential start ups, but established giants are also on the radar of investors/technology giants. These technology giants and investors with whopping amount of investment funds can change the future of any of the industries across the globe. Only richest innovator will survive. This requires the concept of complementary competency. Few fund names are Tiger Global, Naspers, Soft Bank, Tencent, Alibaba, Tesla, Sequoia, Google, Facebook, Microsoft etc. As mentioned in first image revolution 4.0 is fully based on algorithm, deep machine learning. 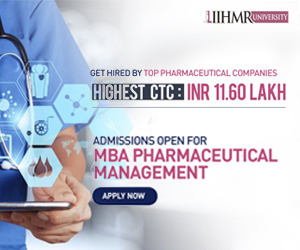 The pharma industry (or any industry for that matter) which is ready to hug technological changes as early as possible in its routine operation will change the domain equations. Each and every industry would require AI, ML not to boost their operations, but to survive. Basic science based industry is far away from this computational analytics and allied fields. In this situation the best way out is to have some sort of strategic alliances with technology giants who are working to analyze human body from neural networking and other point of view. This will lead to very very specific diagnosis and treatment, although future will witness treatment of various disorders at home only by patients only. Big investors and technology companies are providing shoulders to lend on to other companies in a win win situation.